Hope your week is off to a good start; the last month of the year, the most magical, is arrived, time flies. Happy December to you all, may it be wonderful, bright and merry; make the most of it! Bellissima Lilli, stai benissimo con questo look sportivo! Un bacione. che bella Lilli! adoro il cappottino e la bag vintage è una superchicca!!! un bacione! Quanto mi piacciono le sneakers sotto il cappotto, stai benissimo in versione sporty! Beh Lilli a tenil look sportivo dona, me lo mettessi io sarei un pesce fuor d'acqua! Mi piace molto la felpa con la croce e anche gli orecchini, io ormai sono fissata con le croci! ciao Lilli stai benissimo in grigio, che é anche uno dei miei colori preferiti! Clasy, comfy and sporty! Chic also... I love the combination blue+ soft grey! You look great, Lilli! ma come sei bella in versione sporty/chic! Grey and blue looks great! Anch'io fino a qualche tempo fa non avrei mai pensato di riuscire ad indossare le sneakers con cappotti e altri capispalla. Adesso invece questo trend mi piace un sacco. Molto carino il tuo look. Un bacio Lilli. Buon inizio di settimana. Ciao Lilli! I think sporty look is ideal for this times, I need be very comfy in december for all the things that I have to make! Grey and blue is a great election! Happy week hun. I'm loving this sporty look and your gorgeous make up! always so well put together! I like this style too! Looks fantastic! Love it Lilli. 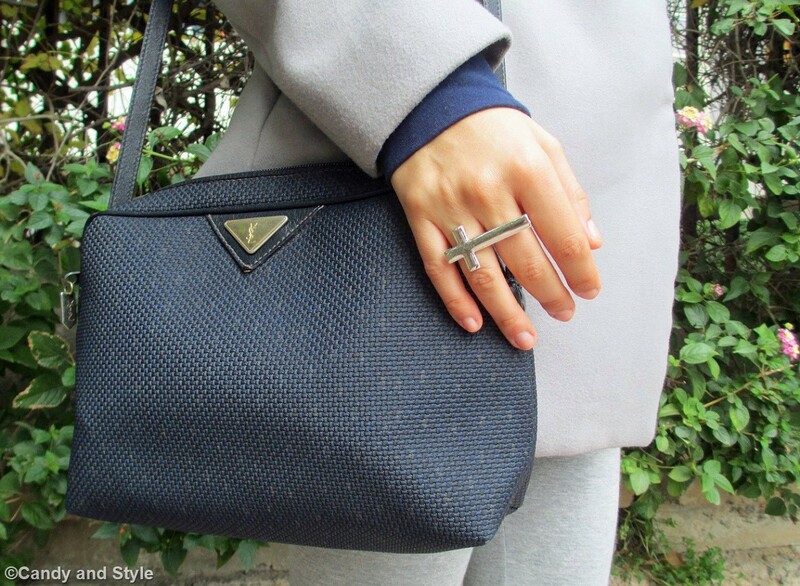 Un bellissimo look sportivo Lilly, adoro il mix grigio/blu. E' un trend che mi piace moltissimo... comodità ed eleganza insieme!!! Ma come siamo belle Lilli! Chic ma tanto comodo.. Poi con i capelli tirati stai benissimo perchè si vedono molto i tuoi lineamenti delicati. You look so sporty cool Lilli! I like your grey coat matched with your blue sweatshirt and bag. Your Adidas sneakers is very nice. Have a wonderful day! UNo sporty chic che mi piace molto, Stupendo il cappotto, stai benissimo in grigio! This all grey outfit looks great, I espacially love the coat!! stai benissimo con cappotto e leggins grigi e tocchi di blu. L'orologio è perfetto e la tua espressione e attitudine anche. sei dolcissima lilli. Adoro questo look sporty Lilli!! Solo tu riesci ad interpretare lo sporty chic in maniera decisamente stilosa!!!! Bello il cappotto e le sneakers, perfetti trucco e parrucco!!!! You look so pretty and adorable in your outfit dear Lilli! Many kisses! Have a great week!!! What a lovely sport outfit!You look gorgeous!! I love your coat and grey color for Winter! I adore your bag! !Have a happy month!Hug! stupendo questo outfit...adoro il cappotto! Hey Lilli! I'm loving the sporty look on you, really fantastic :) I want your coat, it's so flattering on the body and looks super chic! Cute top too, I like the cross print on it :) Grey and blue are so perfect together, great styling Lilli! And gosh.. I want those Adidas trainers =D I hope you have a lovely week hun! Dear Lilli, since weeks i´m searching for cool Adidas sneakers and now i immediately fall in love with your sneakers. I think this neutral color are matches with so many outfits. Gray with a little bit blue looks great together. At the moment i like the sporty chic style too and wearing a coat with sneakers make the outfit very special and very Lilli-like. Have a fantastic week, dear Lilli. I love the grey colours on you! And the neutral lipstick is an interesting change from your usual colours. Looks good! Sporty chic style really suits you very well Lilli so I can definitely see why it's a favorite of yours. It's one of my favorites as well cause you can wear nice things and be comfortable at the same time. I used to feel the same about sneakers as you and now I can't get enough of them. Your coat is so pretty! Love the sporty look and you are rocking that great DW watch! Bahahahaha! Lilli! You are the FIRST person I've encountered who FINALLY admits how much they hated sneakers a few years back! Thank God I am not the only one. Love you even more girl! Lilli, I am kneeling and bowing to you! That BLUE and GREY looks SO GOOD together! It looks awesome on you. I'm totally copying and remembering that combination. GORGEOUS my friend! Cara Lilli, tu sai che anche a me piace molto giocare con i looks sporty-chic e percio' non ti devo dire come mi piace questo look! Sei stupenda in grigio e il sneakers sono ottime. Bellissima ed originale come sempre cara mia! Buona settimana! 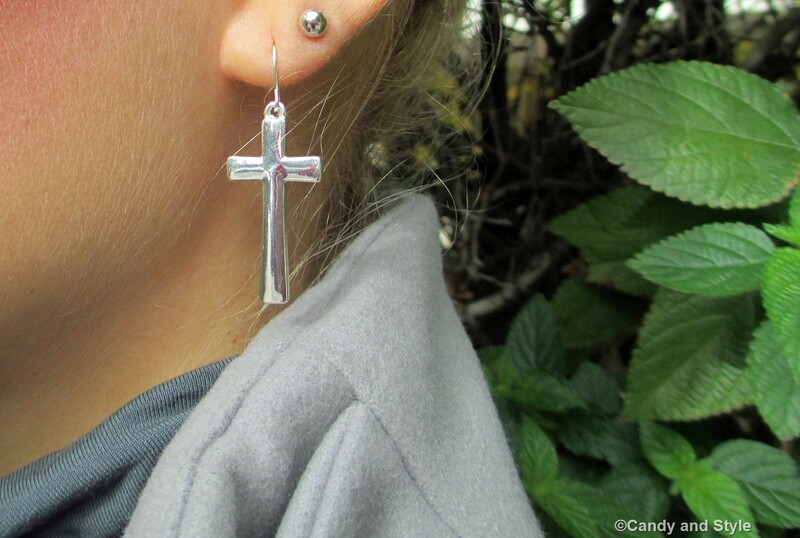 Loving your ensemble of crosses! I love the ring the most - I've always wanted one like that. You look so nice and cozy but still so chic - beautiful! Lilli cara il grigio abbinato col blu forma un abbinamento molto fine ed elegante, anche nei look più casual come il tuo. Sei sempre perfetta! Mi piace tantissimo il cappotto, sia per il modello che per la tonalità di grigio! molto belle le scarpe e l'orologio!! È stato un piacere conoscere il tuo blog! Gorgeous! Pale grey is a favourite shade of mine and it looks great on you. Love that watch too! You do sporty chic perfectly Lilli! I love the mix of grey and the navy details, you truly look so stylish and yet still sporty and comfortable. I can see why it's one of your favorite trends of the moment. Sooooooooooooooooo lovely, mia cara Lilli. Love the touch of silver. 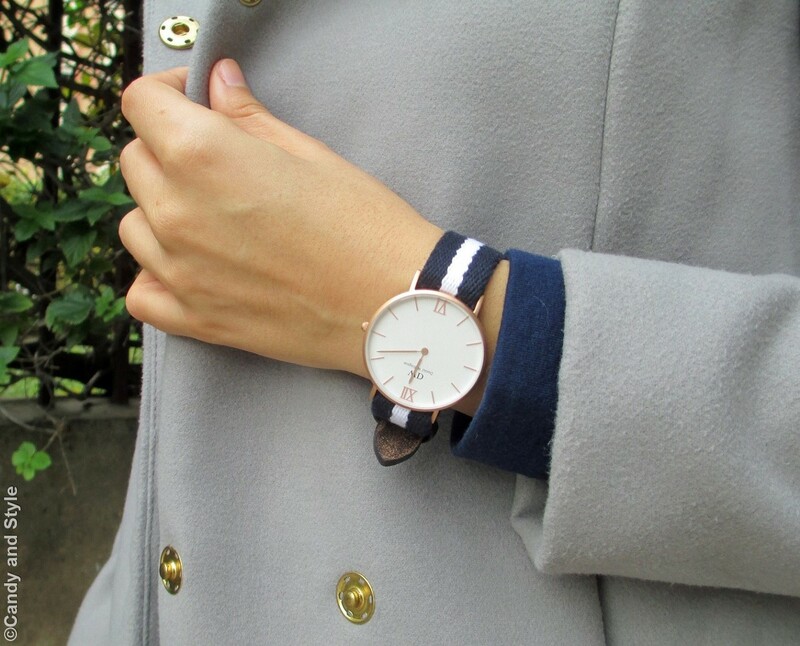 Lilli, you looking so cool and chic always, really love your coat and the watch. Looking fabulous and gorgeous Lilli!!!!! I like this style on you, the coat is really lovely. Che bello questo look grigio con tocchi blu, mi piace da morire il cappottino! Hey honey...i am just amazed to see this lovely combination of grey and navy. It is really a sporty but a glamorous look. Very different and stylish. I would love to copy this style because i love it. You look sooo pretty even without red lip color.. it is a cute change in your makeup. Wish you a beautiful day and happy December. A tight hug to my doll! !